Dr. Hanson is proud to offer, All-on-4. This is a cost-effective treatment solution based on four implants secured in the jawbone to obtain optimal positioning and support of a complete denture. This innovative solution by Nobel Biocare provides the patients with a fixed bridge (denture). The All-on-4 clinical solution has been developed to maximize the use of available bone and to allow for Immediate Function™. 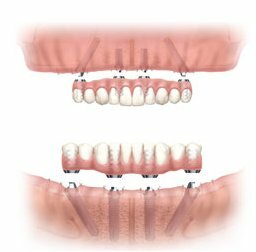 Using only four implants in edentulous jaws, the solution takes advantage of the benefits of tilting the posterior implants to provide a secure and optimal prosthetic support for a prosthetic bridge, even with minimum bone volume. Please contact us for more information or schedule your appointment today!